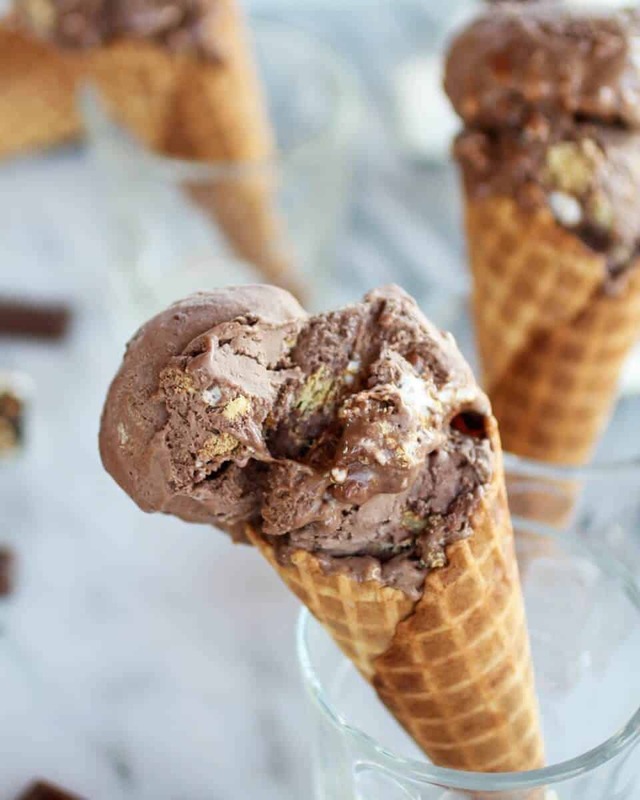 Toasted S’more Chocolate Fudge Ice Cream. I hope you guys don’t mind. I am on a huge ice cream kick. It’s HUGE. My freezer is overflowing and I am not even done, not even close. My ice cream maker has been churning practically every day this week and my hands are permanently frozen. You’d think it was 90 degrees here, humid and sunny. Yeah, like 90 degrees would ever happen around here. More like 60’s, but it has been sunny, and during the day the sun makes it feel a lot warmer than 60’s up here. I’ll take it! 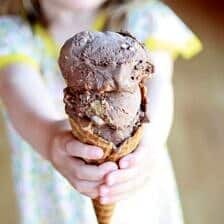 Really I am just loving remembering hot, hot day’s when all we wanted was cold ice cream. I mean that was an awesome summer day when my mom would take all of us kids to Dairy Queen. Normally we could sucker her into it just about any time we were on our way home from the grocery store, the pool, the doctor’s office or after school in late May, early June. Yeah, she was pretty easy to persuade when it came to ice cream. Especially on a hot day. She’s a true kid at heart and honestly she would say we suckered her into it, but the truth is she was just happy to have an excuse to go. You know what’s really hard?? Taking pictures of ice cream. For one, all you want to do is lick the thing. It’s like it’s just staring you down saying, “lick me, lick me, I’m smooth, creamy, fudgy, and so good”. Secondly, it melts – fast. Having your four-year old sister sitting on the table begging you to hurry up. Keeping her hands out of the picture was impossible. It got so bad that I decided to put her to work holding up the cone, which made things even harder because she could not hold still long enough to get a shot. She just keep saying “Tieg, come on. When can I eat it. I want to eat it. Please can you be done now. Come on Tiegy I am hungry for ice cream!” If I was smart I would have taken these shots while she was at school, but I didn’t think about that until about five minutes ago. So about the dress thing she is wearing in the shot below. It’s an extremely ugly nightgown that she HAD to have. What 4-year wants to wear nightgowns? I am telling you guys she is so weird. When I was four I ran around in boxers and maybe a t-shirt and hated getting dressed up. Oh wait, that’s not normal either is it? Don’t blame me. I did not know any better, I grew up with three older brothers and two younger. No one else was wearing girl underwear, so why would I? Asher could not be more different from me when I was her age. She wants to wear dresses, high heals and bikini bathing suits. She loves playing Barbie, dress up and getting her make-up done. I on the other hand wanted nothing to do with anything “girly”. I was the biggest tomboy up until third grade when I finally met my best friend and started crushing on boys. Then I started to care a little more. Ah, those day’s were fun….. and interesting. Ahh, sorry about that blast from the past. It was fun though, right? Ok, you don’t need to answer that. Let’s talk about this ice cream. I made my own chocolate ice cream base, but if you do not have an ice cream maker you can just stir the mix-ins into chocolate or vanilla ice cream. What are the mix-ins you ask?? Toasted marshmallows, graham crackers and a fudge ripple. It’s insane. The perfect s’more all rolled up into chocolate ice cream. And oh my gosh you guys, the toasted marshmallows are out of this would! So much better than not toasting them, obviously. Plus, the fudge ripple?? Toasted marshmallows, graham crackers and a fudge ripple. It's insane. The perfect s'more all rolled up into chocolate ice cream. If making fresh ice cream, make the custard first. In a medium saucepan, combine 1 cup of the cream with the cocoa powder. Warm over medium-high heat, whisking to dissolve the cocoa. Bring the mixture to a boil, then reduce the heat to medium-low and let simmer for 30 seconds, whisking constantly. Remove the pan from the heat, mix in the chocolate and whisk until melted and smooth. Stir in the remaining 1 cup of cream. Transfer this mixture to a medium-large mixing bowl. Set a fine mesh sieve over the top. In the same saucepan, combine the milk, sugar and salt and warm the mixture over medium-high heat. In a medium mixing bowl, whisk together the egg yolks. When the milk mixture is warm, gradually whisk the milk into the egg yolks, beating constantly. Return the egg-milk mixture to the saucepan and continue heating over medium-high heat, stirring constantly and scraping the bottom of the pan with a spatula, until the mixture is slightly thickened and coats the back of a spoon. Remove from the heat, pour through the mesh sieve into the chocolate-cream mixture and stir to blend. Stir in the vanilla extract. If needed pour ice cream back through the strainer one more time. I did this, but only because I had bits of chocolate that must not have properly melted. Cover with plastic wrap and chill the mixture in the refrigerator for several hours or overnight (I stuck mine in the freezer to speed things up). Once the ice cream mixture is well chilled, freeze in an ice cream maker according to the manufacturer’s instructions. While your ice cream turns or softens on the counter, toast the marshmallows. Preheat the broiler to high. Spay a baking sheet with cooking spray and spread the marshmallows out in a single layer. Try and not let the marshmallows touch each other. Broil for 30 seconds to 1 minute, watching very closely! Remove and let cool for a few minutes and then break any apart that melted together. While the marshmallows cool make the fudge sauce. 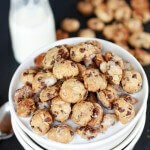 Place the butter, sweetened condensed milk and chocolate chips in a small sauce pot. Heat on medium low until melted and smooth. Stir in the salt. When the ice cream is done churning or softening gently fold in the chopped graham crackers and marshmallows with a rubber spatula. Spoon some of the fudge sauce onto the bottom of your storage container. As you remove the ice cream from the machine or from the carton, layer generous spoonfuls of the sauce between layers of the ice cream, ending with a top layer of ice cream. Do not stir the fudge into the ice cream, as it will make the ice cream very soft. Freeze until the ice cream is firm, at least 2 hours. This looks fabulous! S’mores and ice cream combined – be still my heart! I’m going to give it a try this week-end. Thanks for such great recipes. I honestly think I’ve tried almost every one since I started following you, lol. And Isabella is right: you ARE amazing. Thank you so much Missy! I hope you love this!! Thank you Averie! I was so worried about those shots! I never put people in my photos!! 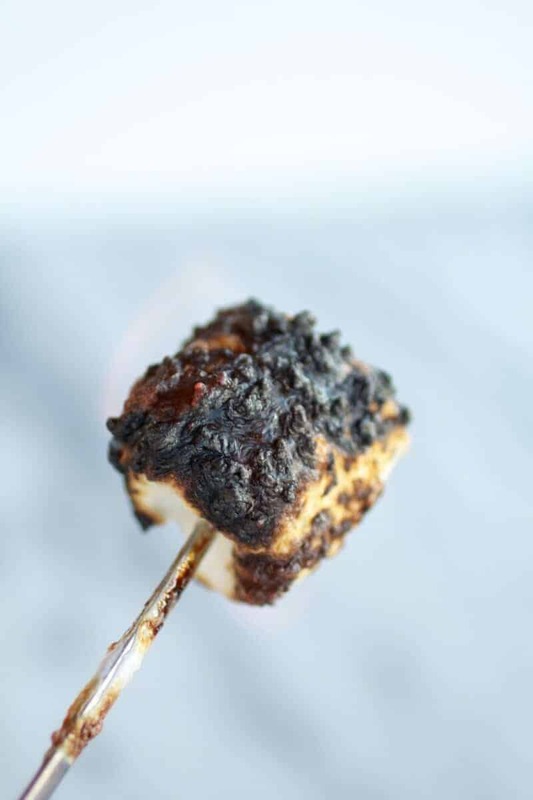 Oh and trust me I completely charred/ melted 2 batches of marshmallows before I finally got it right! Haha! Trust I have been there!! Thanks Rachel! I certainly don’t mind!! Yum!!! Perfect for this time of year! please share at Foodtastic Friday! Thanks Dorothy! I was worried about the photos with her. I don’t normally do that, so I am glad you like them! Oh and don’t burt Marshmallows rule? I love the like that! Oh wow this looks so good. I am definitely pinning. I would love it if you would stop by and share the recipe at my Get Crafty Friday link party! Thank you so much Amy and thanks for pinning! 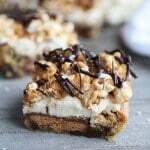 Smore ice cream is such a great idea! Thank so much Kevin! Hope you have a great weekend! S’mores and ice cream are the two perfect summer things, and combined into one? Amazing! Thank you Faith! I agree 120%! I am loving all the summery recipes you’re putting up lately! This ice cream looks insanely good! Perfect for beating this (sudden) sticky hot Texas heat. Love your recipe, Tieghan! Thank you so much Georgia! !The Texas heat sounds pretty nice actually! Happy Friday! Hope there is ice cream somewhere in you future! Oh my heavens! This ice cream looks so amazing! Aaaaaaaaaaaaaaaareyooooooooooooukiiddddiiiiiiiiiiiiiiiiiiiiingmeeeeeeeeeeee? Oh my gosh, this ice cream looks perfect!! 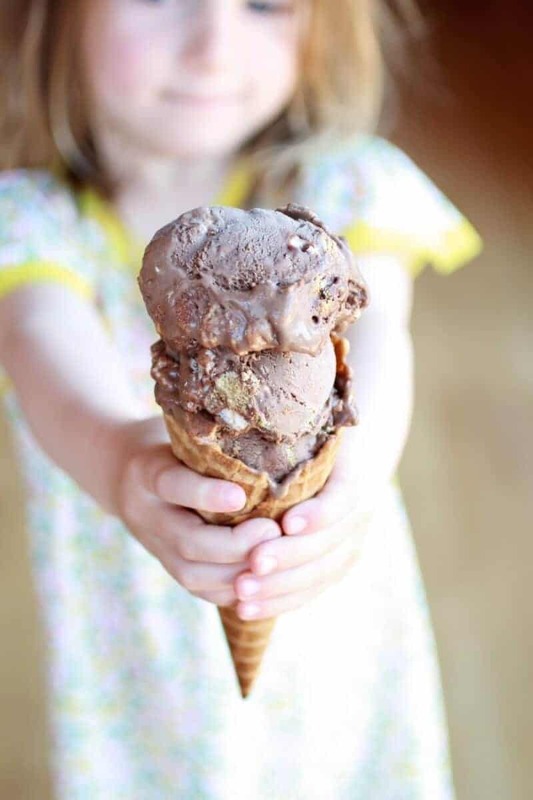 You’ve definitely got the ice cream touch! And that’s the cutest dern 4-year old I ever did see, I tell you what! 🙂 Have a great weekend and can’t wait to see your upcoming ice cream delights! hehe!! Tttttttthhhhhhaaaaaaaannnnnnnnnkkkkkkkkyoooooooouuuuuuu Julia!! Hope you have a great weekend too! Hehe! Of course!! Hope you live close! It really is so much fun making your own ice cream! Thanks Loretta! Your sister is so cute! I try to get my nephews to help me when I’m taking pictures but it’s usually a failed effort. They can never stand or sit still! And I don’t have one of those fancy DSLR cameras or a tripod so stillness is everything! 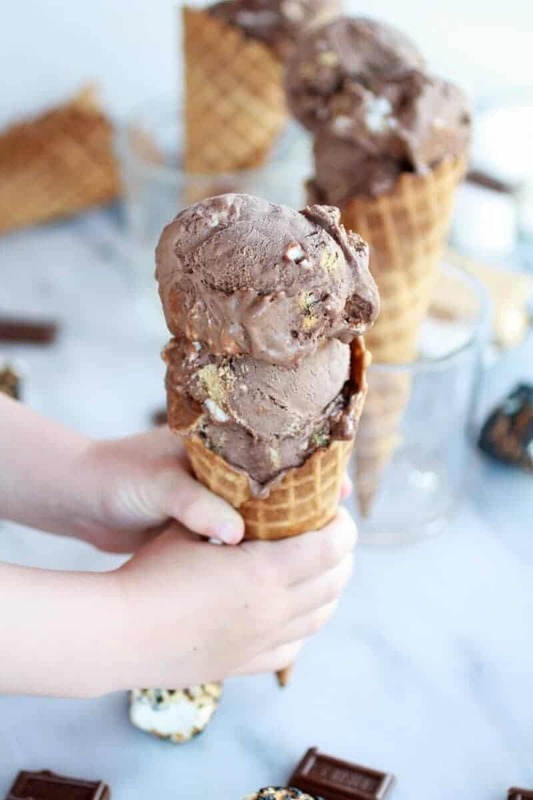 Your ice cream looks amazing and I am seriously considering buying an ice cream maker online right now to try it! Oh buy that ice cream maker!! I promise you will love it and you will never want the store bought stuff again!!! This looks fabulous!!!! Yum, yum, yum!!!!!! Thanks for sharing! You did an awesome job combatting the melting ice cream. The slightly-melted ice cream around the edges of the cones in some of the photos just makes it look that much more delicious! Thank you Kim! I was so annoyed was those little melted spots, so i am glad you like them! Asher is adorable – and pretty smart. Who wouldn’t turn down that ice cream? (The lighting and styling of her holding it is so well done, Tieghan. These photos are some if my favorites.) 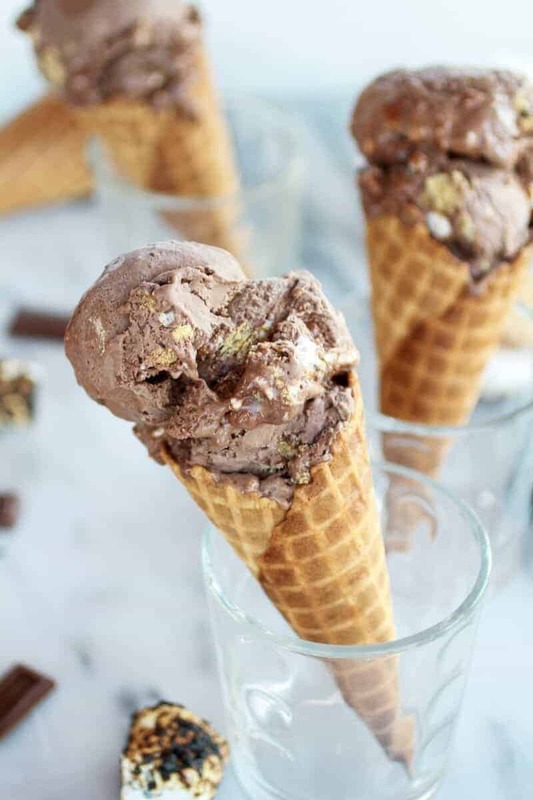 I cannot get enough ice cream, so me and your freezer would be besties, especially if its full of toasted marshmallows and chocolate ice cream … The name alone makes my mouth water! Thank you Mary!! You always leave the sweetest comments! I love reading them! You are killing me!! The toasted marshmallow is genius! You should really write a book or have a tv show! Ha! Wow, thank you Jeni! Well doesn’t that look amazing!! YUM! A must make for sure. Thanks so much Gina!! Hoep you give it a try!! Have mercy. I want to swim in this ice cream and never come out! I’m 100% OK with your ice cream kick, Tieghan. This has to be the best sounding ice cream under the sun. 🙂 Love your photos! I am glad you like the photos, I was worried about using a “living prop”! How in the world could one mind an ice cream kick especially when it results in this kind of yumminess?? Come to mama! Wow! This ice cream looks delicious. I too am the mom who looks for any excuse for my kids to “persuade” me into stopping for ice cream. I saw your link over at homebasedmom and had to check it out. Haha! Thank you Tanna! Sounds like you and my mom would like each other! Oh, wow~ This looks amazing! This might be the year I finally give in and buy an ice cream maker! Ha, you have to do it!! I love mine! Thank you Nicky and thank you so much for pinning! 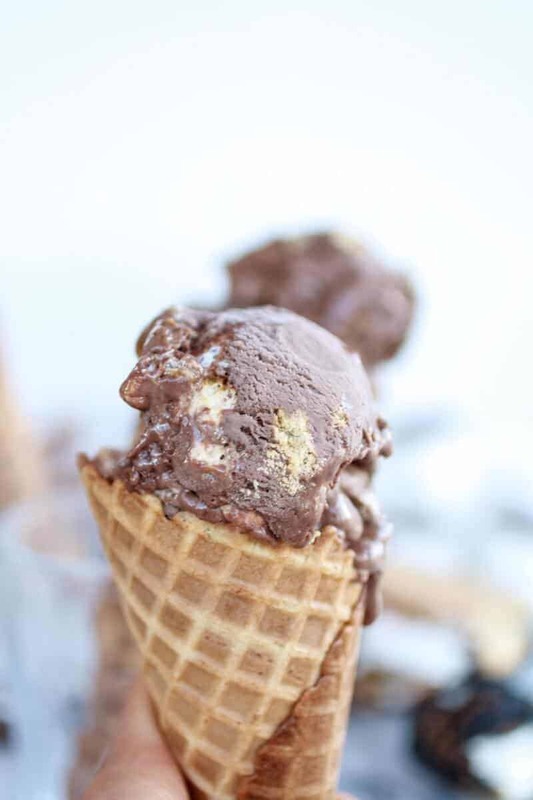 That charred marshmallow is calling my name…ok, the ice cream is too!!! 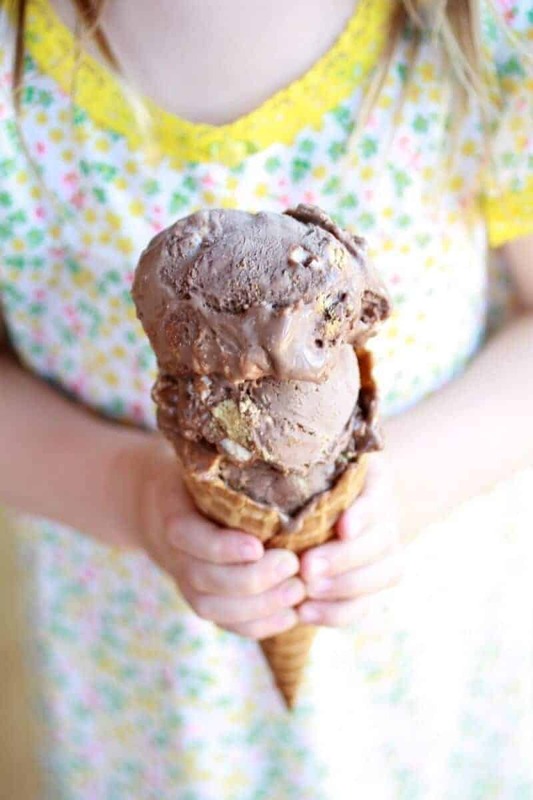 I love that you put toasted marshmallows and fudge into a chocolate ice cream! You totally rock! And the pics with your sister are soooooo cute!!!! This looks delicious! I am going to have to try this – I was just thinking about s’more flavored ice cream a few days ago! Thank you Laura!! Hope you love this! This looks incredible. You took some mighty fine photos! I love making ice cream at home, and burnt toasted mallows are my fave. Can’t wait to try this. Pinning for sure! Thank you Jelli and thank you for pinnin! This ice cream is amazing. What more could you need in an ice cream?! Thank you Caroline! It truly is so good! This is just what I need to push the summer heat away. Hi, I just came upon your amazing blog and I Love It! 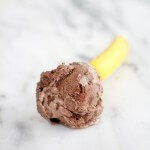 I can’t wait to see more and I am definitely going to have to share this awesome ice cream on fb …. YUM! Thank you Nicole!! I am so excited to have you as a new reader and thank so much for sharing on FB! Oh my, this ice cream looks amazing! I love s’mores, I can’t wait to try this out. 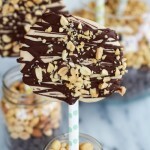 I would love if you would share this on my Sweet Tooth Tuesdays blog link party! Thanks Sarah and thanks for the invite! Did you use all of the fudge sauce in the ice cream? Hi jen, Sorry I should have mentioned this in the recipe. I will add it. No, I did not us all the fudge sauce. I only used about 1/2 to 3/4 of the sauce, but you could use it all. It is a personal preference. Thanks Jen, I hope you love this! Sounds divine! Thanks so much for sharing at Two Cup Tuesday on Pint Sized Baker. I’ve pinned it! Thank you so much Karyn and thanks for pinning! It’s OK. Embrace the drip. It makes it seem even easier to reach through the screen and taste it. I love ice cream, and I love s’mores, so this is pretty much unbeatable. YUM!!! OMG…this recipe is amazing! I was wondering what I was going to do with some leftover half and half and condensed milk in my refrigerator when I randomly came across this recipe. Problem solved! Changes made, simply because of what I had on hand: semi-sweet chocolate, marshmallow fluff, half and half subbed for heavy cream, and 3/4 the called for amount of condensed milk. My kids gobbled this up and so did my husband. That’s saying something because he usually only likes Neapolitan! Haha, hoe perfect you came across my recipe!! So so happy everyone liked it!! Thank you so much for trying it out Heather! Just a quick question, the fudge sauce recipe reads: 1 oz. sweetened condensed milk 14. Is it one 14 oz can or 1 oz from a 14 oz can? Can’t wait to make this, it sounds awesome!